Virginia Legacy 76 hoisted the NPSL Mid-Atlantic Conference championship trophy Saturday at Thomas Athletic Field on the Hood College campus. After going winless in the regular season, Legacy capped a two-win postseason run with a 3-1 double overtime victory over FC Frederick. Legacy advances to the Northeast Region semifinals next week as one of the teams still alive for the NPSL title. Meanwhile, FC Frederick completes its best-ever showing at 5-3. In what was a common theme for FC Frederick this season, the Blue fell behind early in the match only to salvage a second-half comeback led by subs. But on this day, there was no extra magic as Legacy scored twice in the final 11 minutes of the second overtime to seal the result. A defensive miscue left the ball on the foot of James Gunderson, whose perfectly placed shot in the lower right corner gave Legacy a 1-0 lead in the seventh minute. It appeared that goal might be enough, but Drew Demich, playing of the very pitch where he had a standout college career, delivered a game-tying goal for FC Frederick in the 89th minute. The play was started by a long throw-in from Colin Anderson that was headed by Shawn Baker to Demich, for the equalizer. Anderson, Baker and Demich all entered the match after the 60th minute. Four minutes into the second overtime session, Legacy’s Marcel Berry was taken down just outside the penalty box. Ryan Flesch curled the direct kick into the upper left corner of the goal for a 2-1 Legacy lead. In the closing minute, with FC Frederick pushing forward, Berry slide a pass to a wide open James Grace, who ripped a game-clinching goal in the 120th minute. FC Frederick held a 17-12 edge in shots and a 12-6 advantage in corner kicks. However, David Phillips, who came on in the 16th minute as a sub for injured keeper Sam Onyeador, made eight saves in 104 minutes to play, several times thwarting FC Frederick scoring chances. The Legacy 76 will now travel to New Heaven, Conneticuit to face Elm City Express at Reese Stadium on the Campus of Yale University. This is the second year straight Legacy has advanced to the NPSL Regional Semi-Finals. 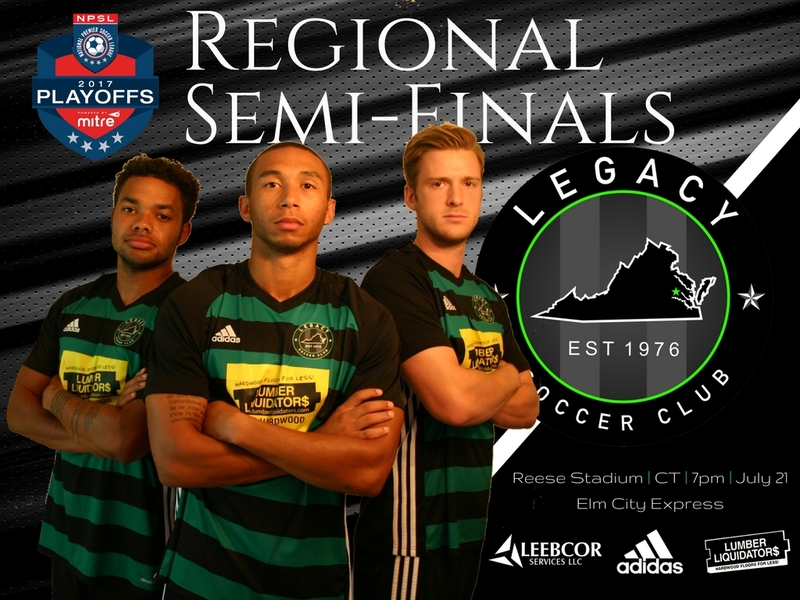 Last year, Legacy defeated Boston City FC at home to advance to the Regional Finals.